The 4th annual Kids Ocean Day was held on November 3rd at Repulse Bay Beach in Hong Kong, where over 800 children, teachers and volunteers bring back “Lap Sap Chung,” Hong Kong’s legendary trash monster, in a message to the world that plastic pollution endangers the ocean environment. “Lap Sap Chung”, or Trashzilla, thrives on plastic trash, and his appearance in Hong Kong sends a reminder from the young community to stop littering the ocean. The image was created from a drawing made by Ty Curnow of The Int'l School of Macau. If your school would be interested to be involved next year in early November, please register here. The age group for the beach participation is ages 8-13. We are also always looking for volunteers, so you can register here if you'd like to be part of an amazing day with inspired children. Your school can also participate by entering the drawing competition, or by having us come to give an assembly talk at your school on ocean protection and awareness by the founder of Kids Ocean Day in the US, Michael Klubock. The 3rd annual Kids Ocean Day Hong Kong in 2015 was about reef protection, and what Hong Kong and the world can do to reduce the impact of fish loss due to over fishing and live reef fish trade. The children asked the world, "Where's My Reef?" with the word "Refrain" in Chinese. The fish was called "Efrain," because he lost the "R" with the loss of his reef. 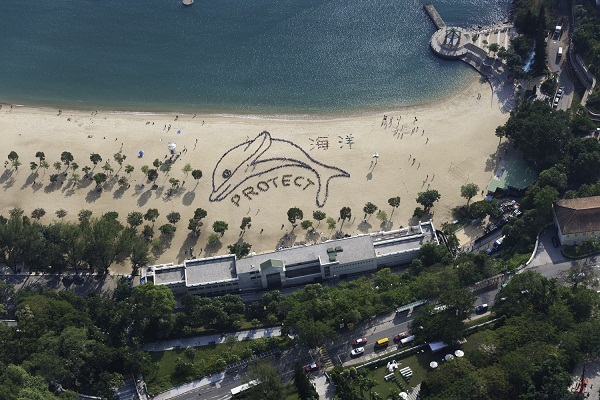 In our 2nd Annual KIDS OCEAN Day Hong Kong in 2013, over 1,000 children, teachers and volunteers created a giant shark on the beach at Repulse Bay. The children then brought the shark "back to life" be re-attaching the fin, and building respect. The Chinese says "Save Me", and the image was made by two local students who submitted their art in our drawing competition. Click to see our short time lapse of the shark being built, and then coming back to life. 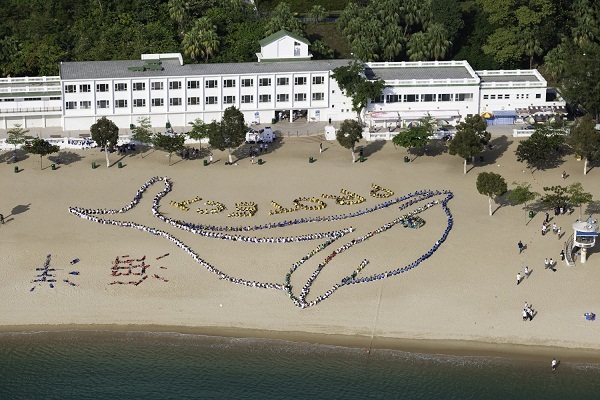 Click here to see a 90 sec video of Kids Ocean Day HK 2013. A four minute video on Kids Ocean Day can be seen here. The ocean is a vital component to our daily lives, particularly in Hong Kong which exists as a global city because of the natural harbour and ocean itself. Photo is courtesy of Jeff Pantukhoff and thanks to the Repulse Bay Apts. for the use of their "crow's nest." As we become ever more aware of the effects of our environmental impact on the ecosystem, the ocean, covering two-thirds of our planet’s surface, is a region that has been relatively ignored since the 1960s since we started sending people to space. We have overfished our waters and neglected its cleanliness, and now realize that the ocean has enormous value to our society if we can protect it and bring it back to its once plentiful state. Kids Ocean Day Hong Kong 2013 reached over 1,600 children directly through school talks, and another 1,800 via the event on the beach and the drawing competition, which had a theme of "What does the ocean have to say." Thanks to Michael Klubock and the Malibu Foundation who originated this event in California 20 years ago, and who was with us again for the school assemblies and amazing beach art, building awareness for ocean protection. This event could not have been possible without the help of our important sponsors:Pacific Andes who thrives on a healthy ocean for their business, Allied World, Disney, the Southern District Council, Ovolo Suites and Hotels, and Heli Services. The image was the creation of three local children artists: Mimi Barguss-Smith of Kennedy School, Grade 5, Pun Ka Yiu of Kwai Ming Wu Memorial School of the Precious Blood (寶血會伍季明紀念學校) Grade 6, and Jerry Ip, of Renaissance College Hong Kong, Grade 6. This image was transposed onto the beach by John Quigley of Spectral Q, who is a famous aerial artist, by this young winner on the beach, to then see his image be transformed into a human art spectacle. The children brought this de-finned shark back to life, sending out the message of respect. The above sequence is courtesy of conservation photojounralist Alex Hofford who was able to get this images from the air thanks to Heli Services. Over 150 drawings were submitted by local primary school children, with a theme of "What Does the Ocean Have to Say?" This year, there was a large percentage of sharks drawn, as the animal depicted in the art creations by our youth. Accordingly, a shark was used for the aerial art on the beach, transformed from the winning images, into a giant image on the beach. Each winner received two tickets to HK Disneyland. Over 30 drawings are now displayed on the walls of Saffron Bakery in the Stanley Plaza. Please stop by to see some of this great art! Below are some images from the “Making of Kids Ocean Day” in 2012. The helicopter filming lets you see some awesome shots of Hong Kong from the air and the great activities of the children. Thanks to Graham Uden and Wolfgang Bern for their amazing work! The general goal of Kids Ocean Week is to raise awareness and understanding about the health of the ocean and its ecosystem. This includes the reduction of pollution, and education about ecosystem protection. The activities begin with a picture drawing competition, where the winning picture is then used as the image on the beach created by children. The Kids Ocean Week activities also involve speaking at schools on ocean protection issues. The culminating event on the beach is held in Repulse Bay on the beach where children are invited to join the Human Aerial Art event. This Art event incorporates students, usually ages 8-12, and is overseen by teachers, as well as local and corporate volunteers, to create an image on the beach that represents a visual ‘ocean message’ to the global community. The message is photographed from the air, allowing for the full appreciation of the human art object to be achieved. Ocean Recovery Alliance, partnering with Bonza Pie, along with the incredible help of the Malibu Foundationand Spectral Q who have been doing this for over 20 years, for tens of thousands of children in California, is committed to changing the way Hong Kong thinks about the ocean and the various pressures it faces, including marine pollution. Through fun, innovative and interactive methods, this project will bring awareness to the community about the effects of plastic in the ocean, marine pollution, ecosystem degredation, and how every person can help to improve the ocean's health for the future. We also thank the Southern District Council and the LCSD for their support in allowing the children to use the Repulse Bay Beach for this event. Special Thanks to our Sponsors, Supporters and Incredible Cast of Volunteers, without which, this event would not happen!